The Dairy Fork Wetland and Habitat Restoration project included construction of 2 acres of wetland and restoration of 25 acres of habitat along Aliso Creek. The wetland improves water quality of the 1,500-acre sub-watershed by naturally treating about 90% of the dry weather urban runoff. The habitat restoration removed non-native species, including about 10 acres of invasive Arundo. Funding provided by four partner agencies and grants from Orange County Transportation Authority and Proposition 84. Aliso Viejo was the lead agency for this project in partnership with Laguna Hills, Laguna Woods and Lake Forest. The project required easements from the County of Orange, Aliso Viejo Community Association and SCE. The project was supported regionally by several agencies and non-governmental organizations within the South Orange County Watershed Management Area. Partner agency funds were leveraged by grants from the OCTA Environmental Cleanup Program and Proposition 84. Challenges during construction were resolved through an excellent working relationship with the contractors HRS and Laguna Canyon Foundation. It was truly a collaborative effort from planning to funding to construction. In addition to the expected enhancements to water quality and natural resources, the project also provides secondary benefits to flood control with excess pond capacity as well as less restricted natural flood plain access through invasive removals. Water supply also benefits by reducing treatment required for water reuse systems downstream. Obstacles existed from the start by needing to obtain easements from multiple agencies. The benefits of the project had to be presented to each agency authorize land use outside of their normal parameters. Construction proved difficult with the existing soil conditions. Extra costs were incurred but savings in other areas allowed the project to stay within the original budget. Project was recently named as Southern California Chapter APWA BEST Award winner for Storm Water Quality. The Dairy Fork sub-watershed drains into Aliso Creek, which is on the impaired waterway list. Initial monitoring of the completed wetland project documents a reduction of indicator bacteria by 99%, as well as reductions of phosphorus, nitrogen and turbidity. These reductions help improve the water quality in Aliso Creek which does drain directly into the ocean. The native plant species used around the wetland ponds as well as in the invasive species removal areas have promoted habitation of birds, frogs, turtles and other native wildlife. The wetland and all the restored habitat and wildlife is in open County park land to be observed by the public. The Dairy Fork Wetland and Habitat Restoration project included construction of 2 acres of wetland and restoration of 25 acres of habitat along Aliso Creek. The wetland improves water quality of the 1,500-acre sub-watershed by naturally treating about 90% of the dry weather urban runoff and removal of non-native species including Arundo. Project completed by 4 partner agencies. 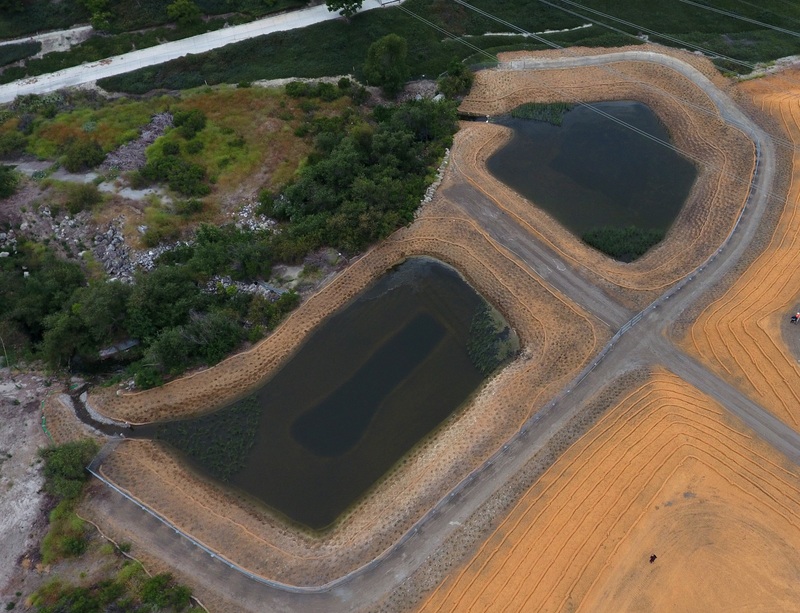 The Dairy Fork Wetland and Habitat Restoration project included construction of 2 acres of wetland and restoration of 25 acres of habitat along Aliso Creek. The wetland improves water quality of the 1,500-acre sub-watershed by naturally treating about 90% of the dry weather urban runoff. The habitat restoration removed non-native species, including about 10 acres of invasive Arundo.